If you love classic gooseneck faucet designs, then you should definitely take a look at the Grohe 62365001 Concetto model. It comes in a stylish modern design and can be a great upgrade to your main or prep sink. Moreover, it offers versatile features and a good price to boot. So let’s dive into the details. Keep reading our Grohe 32665001 Concetto review to learn all about this kitchen faucet. One of the striking features about this Grohe kitchen faucet is the design. 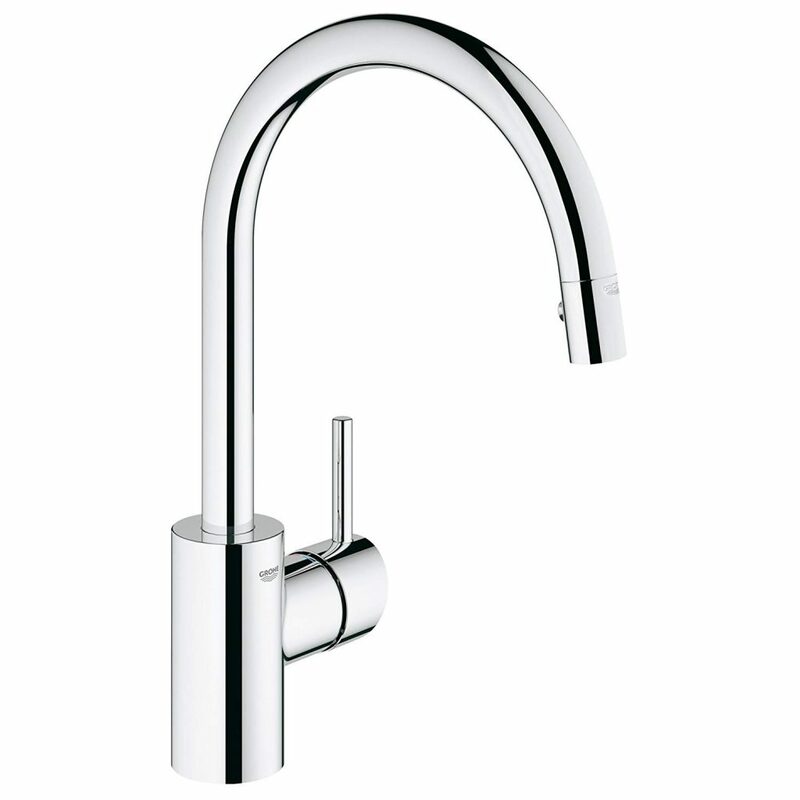 It features a minimalist style with clean lines of the arched spout and an overall sophisticated shape. It’s also a single-lever faucet, so on one hand, you get the convenience of being able to control the water flow and temperature with just one hand, but on the other hand, but on the other hand, it might not give such precise control as a two-lever faucet. However, single-lever faucets have another advantage, which is temperature memory. So if there’s a temperature you most often use, it will save you time from having to adjust it every time. The body of the Concetto is manufactured using solid brass, which is considered to be a durable and an environmentally safe material. It can withstand years of wear and tear. Also, it doesn’t emit any toxins or chemicals. However, the spray head is made of plastic. You can buy this Grohe Concetto faucet in either silver or StarLight chrome finish. Depending on your preferences or the existing styling of your kitchen, you might like it more in the shinier chrome look or a softer silver. If you’ll choose the chrome plating, you’ll get the faucet with Grohe’s patented StarLight technology. They use state-of-the-art machinery and the physical vapor deposition process to create this unique finish. This makes the finish harder and more immaculate. It’s a made-to-last finish that will provide protection against tarnish, corrosion and scratches. The faucet is designed with a 15-1/16 inches height. This faucet is perfect for bigger sinks, giving plenty of clearance to put in the sink large pots and other cookware. However, keep in mind that this faucet might not work for smaller sinks. You don’t want it to look oversized. A disproportionate faucet can also create a lot of messy splash. Another thing to consider is the space above the faucet. Do you have any low hanging cupboards or other elements? Measure the available space above your kitchen sink and make sure that it’s enough to accommodate the 15-1/16 inches height of the faucet. This kitchen faucet is designed with a pull-down spray head that is seamlessly connected to the spout. When you need to get some up-close rinsing power, just slightly pull the spray wand and it will disconnect from its docking system. It will pull down on a flexible hose that is hidden inside the spout and will provide you with a bigger operating radius. You can also choose different functions of the spray head – stream or spray. For example, if you need to quickly fill a pot of water, you can use the regular stream function. However, if you need a more powerful jet of water to rinse off the mess in your sink, press the button on the wand to switch to the spray mode. The stream function though is the default mode, so every time you turn the faucet off, it automatically switches back to it. Another good feature of this faucet is the swiveling spout. For example, if you have a double basin sink, you’d want to be able to have the water delivered to both of them. This Grohe Concetto faucet does just that and moreover, it can rotate a full circle of 360 degrees. So you can even install it on a kitchen island. Grohe also delivers on the quality by incorporating their SilkMove technology. The cartridge of ceramic discs that have a polished mirror-like surface and are covered with a Teflon lubricant. This allows them to glide over each other with utmost precision, providing the friction-free performance of the handle. Grohe doesn’t forget about water conservation, making this faucet highly water efficient. It’s CALGreen compliant and delivers a water flow of 1.75 GPM. You get an aerated stream of water, designed to lower water consumption without sacrificing on user experience. 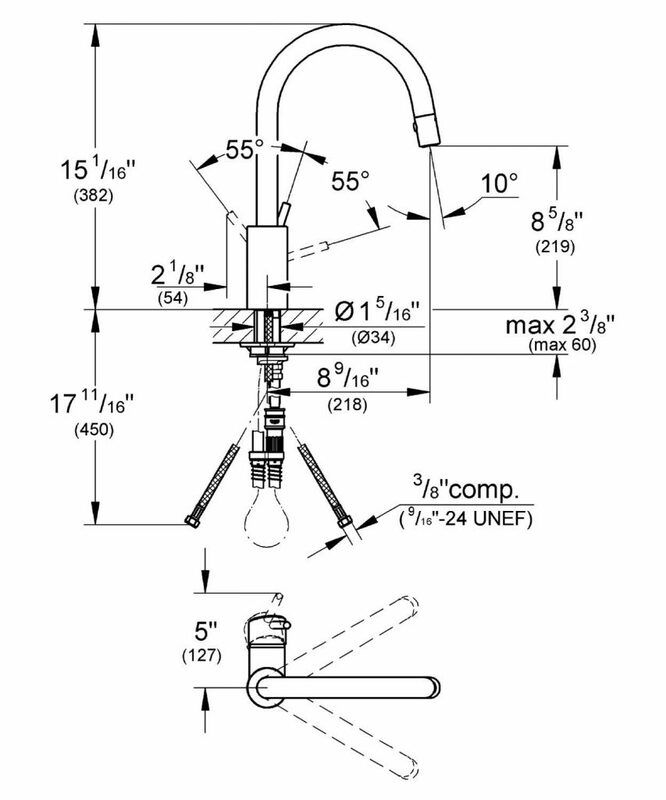 The uncomplicated installation process consists of connecting just a few key parts. These parts, including the stainless steel flex lines, you’ll find included in the product’s package. The process is a simple DIY task and you’ll straightforward instructions to follow supplied by the manufacturer. High quality ceramic disc cartridge. A few users complained about the messy splash that this faucet creates. However, often times the problem is that the faucet is too big for the sink. Also, using the high pressure, pull-down spray head requires a bit of getting used to. The retractor coil that comes for the pull-down spray head doesn’t work very well. However, some users found a solution to this by removing it and adding a counterweight. Some users found switching from regular stream to spray a bit tricky. Once you’ve selected the spray mode, you can’t toggle back to the stream function. You need to turn the tap off and then it automatically resets. It can be a bit of an inconvenience. A few other comments mentioned the low pressure. However, keep in mind that the faucet has an integrated flow restrictor that can be removed to improve that. Not many finish options available. Overall, if you’re looking for an affordable upgrade to your kitchen, the Grohe 32665001 Concetto is a great option. It scores high on the design, durability and functionality. It’s modern and offers great ergonomics. Moreover, your investment gets covered with a limited lifetime warranty, which shows that Grohe is sure of the quality they offer. It does have a few design flaws, in our opinion, but for the price, it’s still good value. If you want a high quality faucet and also ready to invest a bit more, check out Delta and Moen kitchen faucets. We hope that you’ve found the information in our Grohe 32665001 Concetto review helpful in your search for that perfect faucet.